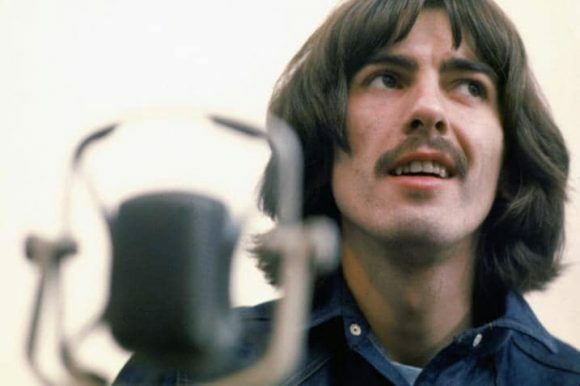 Just as Ringo Starr had temporarily quit The Beatles in August 1968, George Harrison walked out on this day, unable to tolerate any longer the tensions within the group. The Beatles were at Twickenham Film Studios, where their rehearsals were being captured on camera. The day began with Paul McCartney working alone at a piano, playing through a number of songs that the group had been working on during the previous week. These included solo versions of I've Got A Feeling and Get Back, which were usually performed with guitars. The Beatles, still as a group, worked hard on Get Back during the morning. McCartney still hadn't finalised the lyrics, but Tucson, Arizona was emerging as a setting. For one run-through John Lennon took the lead vocals. Following several attempts at working Get Back into shape, The Beatles moved onto Two Of Us. After breaking for lunch, however, George Harrison walked out of the studio. George was usually with us, joining in the conversation, affable and friendly and interested in the give-and-take, but on the day of the Tunisian discussion, he wasn't with us as the meal started. At the morning rehearsal, I could tell by his silence and withdrawal that something was simmering inside him, and so in my role as documentarian, I'd asked our soundman to bug the flower pot on the lunch table. We'd finished the first course when George arrived to stand at the end of the table. We looked at him as he stood silent for a moment. "See you 'round the clubs," he said. That was his good-bye. He left. John, a person who reacted aggressively to provocation, immediately said, "Let's get in Eric. He's just as good and not such a headache." Paul and Ringo would not be drawn in, and after lunch we went back to the studio where Paul, John, and Ringo improvised a ferocious riff, half an hour of anger and frustration expressed with guitars and drums. Yoko sat on the edge of the rostrum on the blue cushion which had been George's and howled into his mike. Harrison later recounted the incident for the Anthology project. Everybody had gone through that. Ringo had left at one point. I know John wanted out. It was a very, very difficult, stressful time, and being filmed having a row as well was terrible. I got up and I thought, 'I'm not doing this any more. I'm out of here.' So I got my guitar and went home and that afternoon wrote Wah-Wah. Then superimposed on top of that was Yoko, and there were negative vibes at that time. John and Yoko were out on a limb. I don't think he wanted much to be hanging out with us, and I think Yoko was pushing him out of the band, inasmuch as she didn't want him hanging out with us. It's important to state that a lot of water has gone under the bridge and that, as we talk now, everybody's good friends and we have a better understanding of the past. But talking about what was happening at that time, you can see it was strange. Whether in denial or disbelief, the remaining three Beatles carried on rehearsing without Harrison. Just as they'd worked on Back In The USSR and Dear Prudence without Starr, here John Lennon led the others through The Who's A Quick One, While He's Away – the title a clear reference to Harrison. At one point he was heard to sarcastically call out "OK George, take it!" George left because Paul and he were having a heated discussion. They weren't getting on that day and George decided to leave, but he didn't tell John or me or Paul. There'd been some tension going down in the morning, and arguments would go on anyway, so none of us realised until we went to lunch that George had gone home. When we came back he still wasn't there, so we started jamming violently. Paul was playing his bass into the amp and John was off, and I was playing some weird drumming that I hadn't done before. I don't play like that as a rule. Our reaction was really, really interesting at the time. And Yoko jumped in, of course; she was there. Yoko Ono positioned herself on Harrison's blue cushion, and wailed over the top of a series of barely-listenable, blues-based jams. The three Beatles joined together in the harshness of the music, possibly finding it cathartic amid the uncertainty of the day. The aggressive tone carried through to the proper work, when it continued. The group performed jagged versions of I've Got A Feeling and Don't Let Me Down, with Lennon screaming during parts of the latter. He also sang Maxwell's Silver Hammer in an exaggerated German accent. After some half-hearted runs through cover versions The Beatles largely stopped work to discuss the future of the Get Back project with the crew, although McCartney returned to his piano. As he did, Yoko Ono began wailing to his accompaniment, seemingly oblivious to the tensions in the room. The Nagra reel-to-reel tapes that were recording audio for the cameras captured Lennon in conversation with director Michael Lindsay-Hogg. Lennon at one point suggested replacing Harrison with Eric Clapton if he didn't return within a few days. A series of jams took place towards the end of the day, again with Ono moaning or screaming largely wordless vocals. Finally, McCartney moved to drums, Lennon played guitar and Starr took the microphone for some improvised spoken lines, words which summed up their aimless desperation at this time. Yeah, rock it to me baby! That's what I like! You may think this is a full orchestra, but if you look closely, you can see there's only two people playing and one person singing. I know it sounds like Benny Goodman, but don't worry, it's the big sound of 1969! You bet your life! Oh, sock it to me, sock it to me! On the Nagra reels you can hear someone, presumably John, start a riff on guitar then George say “I’m leaving the band now.” John says “When?” and George repeats “Now.” It’s a big muffled what he says next but it’s along the lines of asking about his guitar case and then he says something about Apple, then he’s gone. It’s too bad the famous “see you round the clubs” remark wasn’t recorded (although that’s just my voyeuristic side coming out) but it seems like the exchange on the Nagras happens, then they have lunch and George makes his announcement. It’s hard to tell what’s the truth and what’s just recollection here though. I guess it’s still a controversial subject, just like the Let It Be film itself – still not having been released on DVD or Blu-ray, to my knowledge. A year after AlbertCunning’s comment[i.e. me], John and George’s little fisticuff on this day is still not treated as something that really happened, despite John alluding to it in the Rolling Stone interview nearly two years later.